Finding for the best-used vehicle which suits your need will surely take more time than your expectation. When you fixed finally with the specific vehicle then it seems to be highly tempting to rush into buying process to drive the vehicle as soon as possible by getting into the car seat. Before you commit to getting a vehicle for your drive, there is an essential step to consider is “Pre-Purchase Inspection”. Usually, the pre-purchased vehicle inspection is carried out by an auto technician or licensed mechanic who will provide the vehicle with a thorough inspection to find out the mechanical, cosmetic & safety condition. The qualified mechanic will tend to identify any existing problem and highly possible troubles which could take place in future. Moreover, they will investigate to ensure that any existing damage has been repaired properly. Why Must Car Inspection Be Done? By learning more about what is taking place under the hood, you can get more confident that you are creating a great purchase from the car dealership. 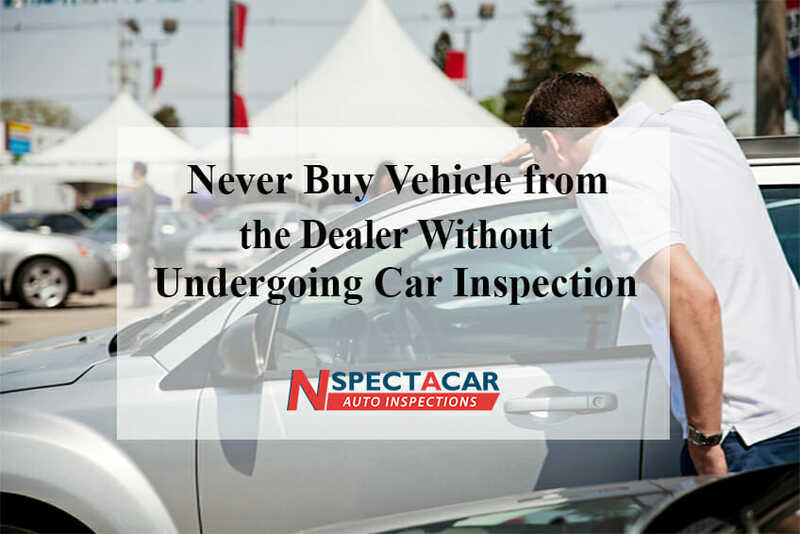 If you are purchasing a vehicle from the trusted dealer then it is essential to conduct car inspection. You must take the vehicle to an independent mechanic for inspection purpose. Your mechanic will perform a safety inspection to analyze numerous things during the pre-purchase inspection. Fundamentally, you need to have a vehicle history report which will allow you to know about vehicle damage history. With aid of vehicle inspection, the vehicle’s damage will be thoroughly and carefully repaired. Basic inspections are highly visual however if you are searching for the detailed inspection then it must incorporate mechanical and engine system check which includes checking for rusted or broken components, leakages and many more. The qualified mechanic will take your vehicle for a test drive in order to evaluate its steering, listen to strange sounds and braking noise. Car inspection will save you from spending plenty of money in the future. What to Do If You Find Damages in Car during Inspection? The damage of the specific vehicle is based upon the various factors. However, a vehicle with damage history seems to be the great buy when you have the chance to get more advanced model than your consideration. The Pre-purchase inspection is the best way to make sure that previous damage has been repaired properly and the vehicle is safe for riding. The extent of vehicle damage seems to be the great negotiation while you are discussing the price rate with the seller. If the seller informs that there was no damage in the vehicle and does not prove with aid of CarProof report then you can reconsider doing car sales with them. If the seller found to be dishonest on the vehicle information then it is questionable to trust him. Buying a used car without inspection report is similar to playing roulette at the casino table without much experience. You must have a detailed inspection report in your hand to get a good deal from car sales. It is mandatory that the vehicle must be inspector prior to fixing with the deal.